In 2011 the international development community committed to make development co-operation more effective to deliver better results for the world’s poor. At the mid-point between commitments endorsed in the High-Level Forum in Busan, Korea in 2011 and the 2015 target date of the Millennium Development Goals, this report takes stock of how far we have come and where urgent challenges lie.This report - a first snapshot of the state-of-play since Busan - reveals both successes and shortfalls. It draws on the ten indicators of the Global Partnership monitoring framework. Despite global economic turbulence, changing political landscapes and domestic budgetary pressure, commitment to effective development co-operation principles remains strong. Longstanding efforts to change the way that development co-operation is delivered are paying off. Past achievements on important aid effectiveness commitments that date back to 2005 have been sustained. Nevertheless, much more needs to be done to translate political commitments into concrete action. 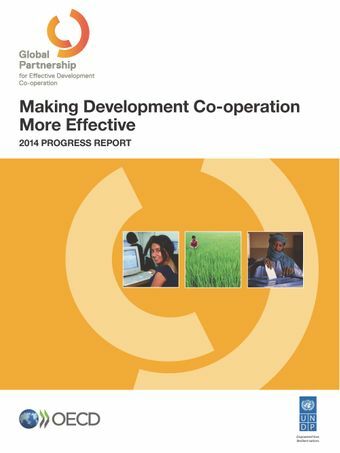 This report highlights where targeted efforts are needed to make further progress and to reach existing targets for more effective development co-operation by 2015. WHY IS PROGRESS TOWARDS BUSAN COMMITTMENTS IMPORTANT? Assessing aid principles strengthens development co-operation. Assessments provide a strategic tool for donors and developing countries to hold each other to account. The monitoring exercises emphasise behaviour change in development co-operation efforts, this contributes to achieving the results defined in countries’ development strategies. It is important to provide evidence of progress and signal opportunities as well as obstacles for further progress. Supports accountability among stakeholders for the implementation of the Busan commitments on aid effectiveness and actions by providing a snapshot of progress at the international level. Stimulates multi-stakeholder dialogue at both country and international levels on how to improve the effectiveness of development co-operation. Reaches agreements on specific actions that are needed to enhance successful implementation of the principles on aid effectiveness and support accountability at country level. The report draws on the results from the monitoring as well as other qualitative evidence, to provide a rich picture of progress made by all development partners towards effective aid. Ten indicators and corresponding targets have been identified for monitoring the Busan commitments. Five indicators build on the indicators used in the “Survey on Monitoring the Implementation of the Paris Declaration”and include: use of country systems, alignment with country’s own development objectives, predictability, aid untying and a focus on results, and mutual accountability. Five indicators have been developed based on what partner countries identified as important to capture the broader dimensions of the Busan Partnership agreement. Data is available via the OECD’s dot.stat. Countries are encouraged to use their country-level data for their own ends, such as in the production of country reports, or to feed country-level discussions.